For my new geo-tagging project, I’m trying to come up with a manageable number of consistent subject terms to describe what a sticker is about, i.e., what people in library and information science call creating an authority control or set of keywords (index terms). One can go a little crazy in this endeavor, because there are so many comprehensive guides to refer to, such as the Library of Congress Subject Headings, the Getty Research Institute Art & Architecture Thesaurus, various ARTstor Subject Guides, and plain old common sense. My goal is to narrow it down to about 20 keywords, and here is what I have so far (22): Animal Rights; Authority; Capitalism; Conflict/War; Demonstration/Protest; Economy; Education; Environment; Gender; Globalization; Government/Politics; Identity; Immigration; Labor; Music; Nationalism; Race/Ethnicity; Religion; Sports; Surveillance; Technology; and Urban Development (includes Anti-Tourism, Gentrification, Reclaim the Streets). Or to keep it simple, in most cases I could just put Power/Control. There are also other terms that I want to include that describe how a sticker functions and/or what rhetorical strategy was used to create it. This list is much shorter and still needs work: Advertising/Publicity; Adbusting/Appropriation/Culture Jamming; Creative Expression; D-I-Y; Humor/Irony/Satire; Postal/Hello-My-Name-Is; and Tagging. Here below, for example, is one sticker that I’ve tagged. 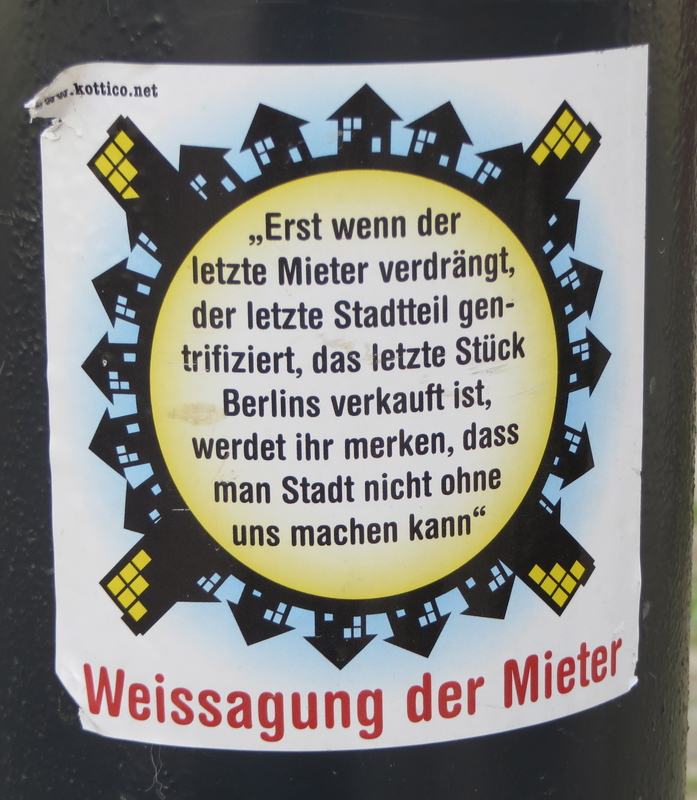 The title of the sticker, “Weissagung der Mieter” means “The Tenants’ Prophecy,” and the text reads “Erst wenn der letzte Mieter verdrängt, der letzte Stadtteil gentrifiziert, das letzte Stück Berlins verkauft ist, werdet ihr merken, dass man Stadt nicht ohne uns machen kann,” or roughly, “Only when the last tenants are displaced, the last quarter is gentrified, the last piece of Berlin is sold, you will realize that you can not do without our city.” My initial tags included: Capitalism; Economy; and Urban Development (includes Anti-Tourism, Gentrification, Reclaim the Streets). Since the sticker has a Web site listed on it, www.kottico.net, I also included Advertising/Publicity. 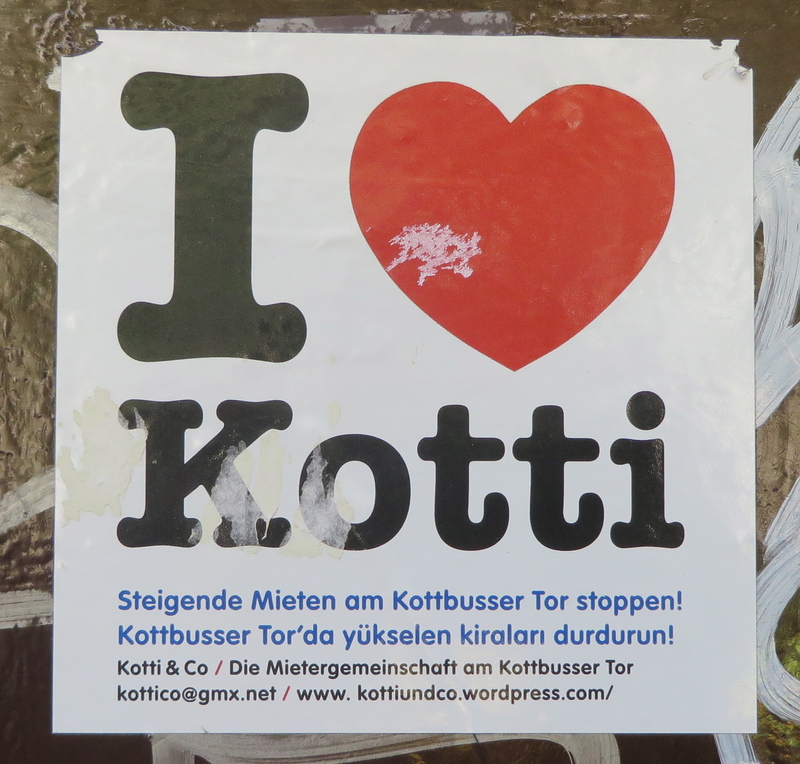 When I went to the Web site, I learned that there is a group called “Kotti & Co” that was formed in May 2012 in the working class Kottbusser Tor district in Berlin-Kreuzberg, an area populated largely by residents from Turkey. 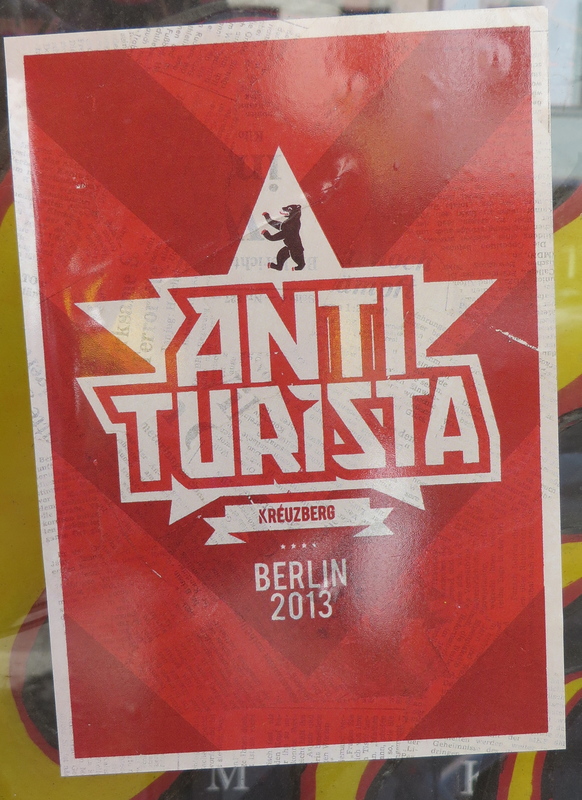 In fact, Berlin is the largest city of Turks outside of Turkey, according to Eva Spirova in an article entitled The Multicultural Kreuzberg on the blog Berlin: A Divided City. Germany developed an official Turkish recruitment agreement in 1961, which has since brought in millions of guest workers. The project has been “an unnecessary social, economic and political catastrophe” however, for the workers’ children and grandchildren who can’t find jobs and are often socially marginalized, according to Klaus Bade of the German Foundations on Integration and Migration. For more information, see At Home In a Foreign Country: German Turks Struggle to Find Their Identity in Der Spiegel (November 2, 2011). As a side note, another article, Graffiti and Street Art, on the blog above states that “…stickers and adhesives are not considered graffiti.”!